Just a quick update on my 2011 Goals (see “goals” tab at the top). I’m pretty happy with how well I’ve been able to follow through on some of my goals for this yea. The Etsy shop is still in the process of getting set up, but I’ve set a deadline for having some inventory in there by the end of April. A few tutorials have been posted and there are ideas for a lot more! My only area where I haven’t made much progress is in getting guest bloggers. A few people are definitely interested, but haven’t had time to write something – so that will likely happen over the summer. This is a quilted bag that was featured in the April 2011 issue of American Patchwork and Quilting. It is designed by Edyta Sitar of Laundry Basket Quilts. The picture in the magazine was too cute for me to pass up; it reminds me of a Vera Bradley bag with the quilted fabric and the modern lines. While I am happy with the finished project, it was more time-consuming and a bit more challenging than I expected it to be. There is nothing difficult per se about the pattern, it’s well-written and straight forward, it’s just hard to make this look as good as the picture on the first try. One area of trouble was gathering the corners so that bag had a nice round shape. My bag looks more like a rectangle with rounded corners. Not a super big deal, but the shape of the bag is important. The binding was also a challenge. In the instructions, she uses a single fold binding that is machine sewn on one side and then the other side is folded over and hand-stitched. I machine stitched both sides since I knew this would go on the UFO pile once I had everything done except the hand stitching. 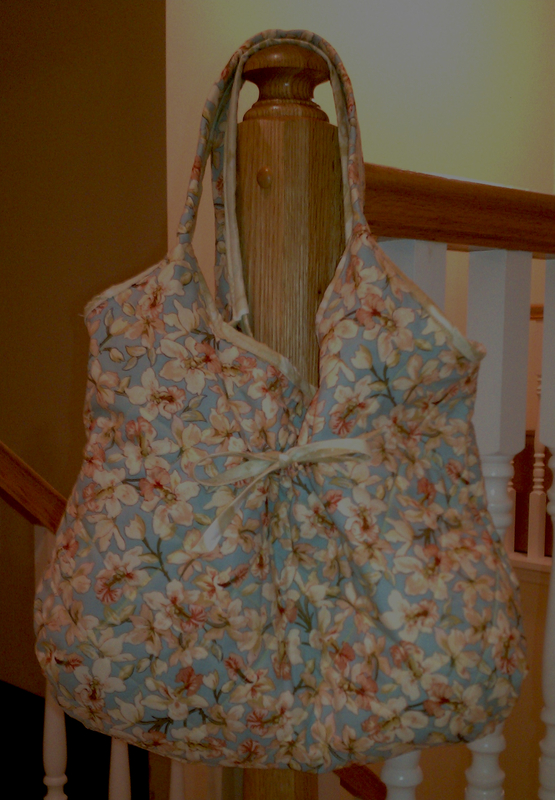 You can’t tell in the picture, but the binding around the handles is not the neatest. There is an unattractive place where the binding overlaps and is bulky. Also, since it is stitched by machine, you can clearly see the crooked seams on the underside of the binding. It took a few hours to apply the binding – it is a 5 step process – you bind each of the four curves on the top of the bag, then go back and bind the handles. Once I get better at binding, I could see making this again. It would go much faster! But, it’s a fun little bag and I really like the fabric. I’ve had this fabric for awhile, and wasn’t quite sure what to do with it. It makes a nice spring bag. This entry was posted in Purses and Totes, Quilting. Bookmark the permalink. This is a very nice bag. I can’t see the flaws that you point out so am anxious to see it first hand. I’m learning more and more what to look for. Well, the rule of thumb is that if you couldn’t see the flaw from a moving horse, than it’s not noticeable :). love the bag. I have some more perfect fabric for this purse but if you had “issues” then I will pass. PS Can NOT see your “errors”. What fabric were you thinking? I have another pattern that is similar, but you don’t bind it. It could be made out of quilted fabric though.